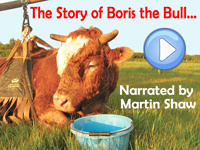 'The Story of Boris the Bull' narrated by our patron, Martin Shaw, is now available on DVD. Click below to order free copy or CLICK HERE to view online. CLICK HERE TO VIEW PROGRAMME . . .
WE REPORTED FOOT AND MOUTH FARM TWO MONTHS BEFORE DISEASE WAS DETECTED in 2001 . . .
Burnside Farm at Heddon-on-the Wall was the subject of a Hillside investigation just two months before the first British case of F&M was detected there. We had received information that there were rotting carcasses amongst live pigs, piglets being eaten alive by other pigs, and sickly-looking pigs indicating the possibility of a disease being present. The Waugh brothers, who ran the farm, had previously been evicted from a pig farm by a local council where pictorial evidence also revealed pigs living in absolute squalor. On arrival at Burnside we could see what we now know may have been the contaminated swill which was being fed to the pigs. We reported our concerns to the appropriate authorities expecting them to fully investigate. 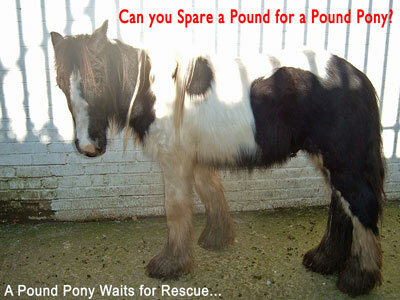 The farm was inspected 22nd Dec 2000 by Trading Standards and MAFF. At the time these government officials claimed they could find no prosecutable offences and simply 'advised' the Waughs to clean up. 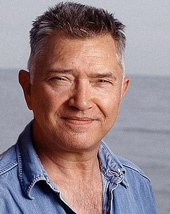 However, soon after this farm was confirmed to be the source of the F&M outbreak, Mr Waugh was convicted of several charges, including causing unnecessary suffering to animals. 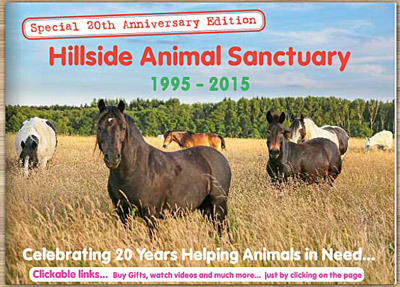 Hillside's investigation team have video evidence to prove that time and time again all species of farm animals are routinely left to suffer injury, illness and disease without any care or veterinary treatment. Can we really be surprised that such a serious disease was overlooked when finding sick animals in the intensive factory farming industry is so commonplace? 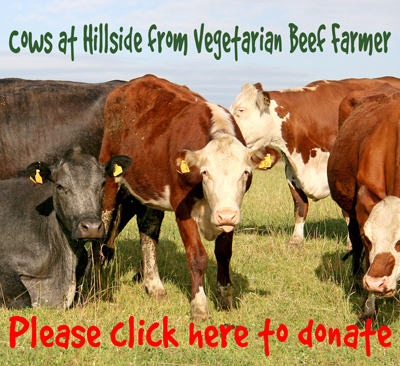 During Christmas, the village where I live, was resounding with the sound of cows bellowing out for their calves. People went about their business seemingly oblivious to the dreadful mental torture those animals were going through. Even Christmas Day churchgoers, in full earshot of the desperate calling, just turned the other cheek. If it had been a human mother who had been so ruthlessly separated from her baby and been in such distress the whole village would have turned out, trying to help. Shopping online? 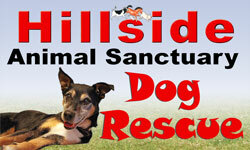 Raise funds for Hillside at no extra cost to you! 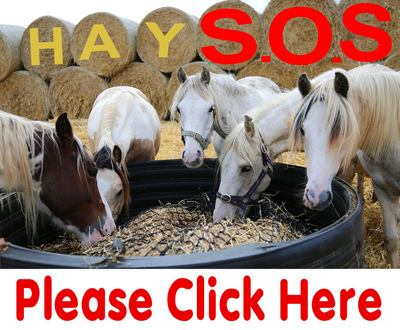 Please Help Cows in Crisis! 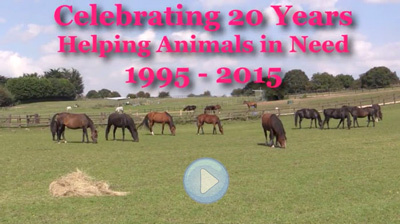 Channel 5 and Sky News show our farm animal investigation footage. Our evidence exposes yet another RSPCA Freedom Food Scheme monitored farm, keeping ‘free-range’ hens in appalling conditions. Five rescued donkeys who were destined for the slaughterhouse, arrive from France. 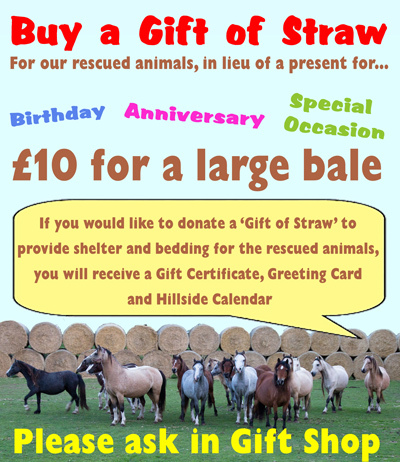 Click to see pictures . . .
We film ANOTHER Bernard Matthews' worker kicking turkeys. BBC1's 'Whistleblower' featured a Hillsideinvestigation which exposed serious bio-security lapses in the poultry industry. April 06 - Daily Mirror and Daily Mail reported another Hillside investigation - we filmed turkeys being sadistically beaten at Bernard Matthews! 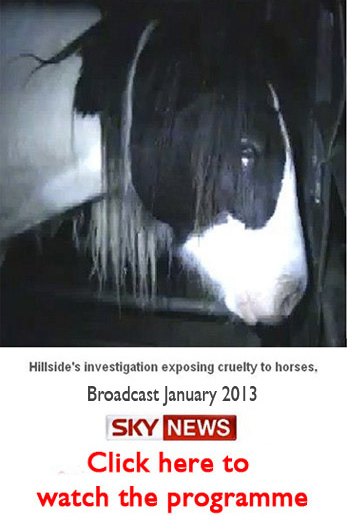 Sky News (Jan 06) Hillside investigation footage was broadcast exposing the appalling conditions that ducks being produced for M&S, Morrisons and Iceland are kept in! Click here to view Sky News clip. BBC1's 'Inside Out' (Oct 05) was based on Hillside's video 'Pigs in Purgatory'. We had filmed this accreditated farm, for 18 months and despite it being reported 4 times to DEFRA, conditions didn't improve! Click Here to view 'Pigs in Purgatory' . Click here to request a FREE video or DVD. We have exposed THREE illegal slaughterhouses resulting in prison sentences.